'Cruise Ship on Land' Bringing Bowling and Movies to Historic 23 Wall St. 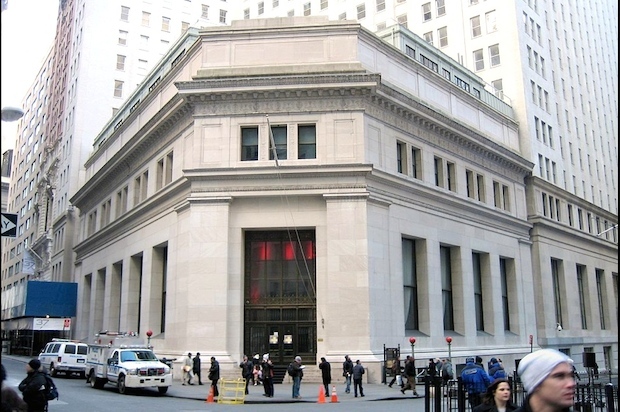 Latitude 360 Coming to 23 Wall St.
FINANCIAL DISTRICT — A massive entertainment complex — which includes a bowling alley, arcade, restaurant, concert venue and movie theater — is slated to open in a long-empty, landmarked Wall Street building. The huge center, called Latitide 360, is planned to open within a year at 23 Wall St., a historic building that sits across from the New York Stock Exchange, said CEO Brent Brown at a Community Board 1 meeting Wednesday night. The venue and restaurant — which the company refers to as a “cruise ship on land” — is meant to be a “multigenerational place where there’s something for everyone,” Brown said Wednesday, presenting the concept for the first time to a skeptical CB1 committee. Latitude 360 will take up the entire 110,000-square-foot, five-story space, Brown said, with about 60,000 square feet filled with the theaters, restaurant and bars. Two top floors will be used for offices, as well as space for corporations to hold meetings, before enjoying the Dave & Buster's-like venue below. The plans for Latitude 360 include a “luxury” bowling alley, an arcade, a dine-in movie theater and a stage for live comedy and music. There will also be a bar and a “sports theater” dedicated to watching games. Brown said he's about to sign the lease for the space and will file an application for a liquor license by the end of January. He also has deals in the works to bring his Latitude 360 to a spot near the Atlantic Center in Brooklyn and to two Midtown locations, as well as to Jersey City and Atlantic City. The center has locations now in Pittsburgh, Pa., Jacksonville, Fla. and Indianapolis, Ind. One is also opening soon in Albany, he said. Many at the community board meeting were not pleased with what some called a “Disneyland” concept. Linda Gerston, a CB1 member who lives in the high-rise 15 Broad St. condos that are attached to 23 Wall St., was outraged by the idea of Latitude 360 opening in the historic building. “This concept does not belong in a mixed-use neighborhood,” she said. “These are multimillion [dollar] apartments…they’re not just people who go to Cheesecake Factory,” she said. Community members were also concerned about the increased foot traffic and revelers hanging out and smoking late into in the evening in the otherwise quiet area. Brown hopes to stay open until 2 a.m. on the weekends. He’ll return to the board once he applies for his liquor license, seeking the board's advisory support.